Ranked Battle is one of the multiplayer mode categories in the Splatoon series. These battles can last for five minutes, instead of the three minute long Turf Wars. The battle can be shorter or longer depending on the outcome of the game. It features several modes and is accessible once a player hits Level 10. The modes included in this category require a higher level of strategy compared to Regular Battle, and wins and losses are counted toward players' ranks which are used for matchmaking. 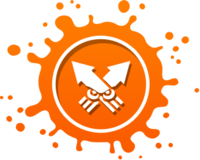 Ranked Battle was released when a large amount of Splatoon players reached Level 10 on 1 June 2015. Ranks originally ranged from 'C-' to 'A+'. On 5 August 2015, version 2.0.0 increased the rank cap. Ranks then ranged from 'C-' to 'S+'. Ranked Battles were available at launch with Splatoon 2, though players still must obtain Level 10 to play. All modes were kept from the previous games, with minor improvements made. Along with the 2.1.0 update on 13 December 2017, a new mode called Clam Blitz was added. A new rank, Rank X, was added in late April 2018 with the 3.0.0 update. Stages will rotate out every four hours along with the stages from Turf War, at 02:00, 06:00, 10:00, 14:00, 18:00, and 22:00 UTC. The change in stages are accompanied by an announcement from the Squid Sisters. This announcement will also boot all players out of the lobby after they finish their current match. The mode will also rotate between Splat Zones, Tower Control, and Rainmaker at the same time. Similar to Splatoon. Splatoon 2 features stage rotation every 2 hours. Again similar to the first game, Off the Hook will give an announcement when the stages/mode change. Players can also view the stage schedule from their smart device using SplatNet 2 on the Nintendo Switch Online App. However, since version 3.0.0, the stages chosen each come from a list of 8 stages per Ranked Battle mode that change every month with the X Power reset. Unlike in Regular Battles, the music in a Ranked Battle does not change to Now or Never! when there is one minute left. Once a player's rank changes after a match, a message saying "RANK CHANGED! Re-enter the lobby to pit your skills against players closer to you on rank!" will appear, and the player will be forced to exit. Certain stages had stopped appearing in the stage rotation pool for Ranked Battles, as well as other online modes featuring Ranked modes. However, these stages are still playable in Private Battles. There was a scrapped Ranked mode, 8-Ball. Much like in the Octo Expansion, teams would shoot a ball and try to get into the enemy's goal. It also seems that extra walls and ramps were added, to prevent the ball from falling off the stage. An early screenshot of receiving Battle Points after a Ranked Battle. Splat Zones at Saltspray Rig. Tower Control at Urchin Underpass. An Inkling carrying the Rainmaker at Hammerhead Bridge. Splat Zones at Moray Towers. The result screen after winning with a knockout. This page has been accessed 66,492 times.